Just in time for Disney’s release of their live-action musical version of Beauty and the Beast, a tale as old as time arrives in a glorious new, unabridged edition. Miraphora Mina and Eduardo Lima, the graphic artists behind the MinaLima design studio, were responsible for many of the props in the Harry Potter movies. As with their previous editions of Peter Pan and The Jungle Book, they’ve made a new edition of a classic, a classic in its own right. 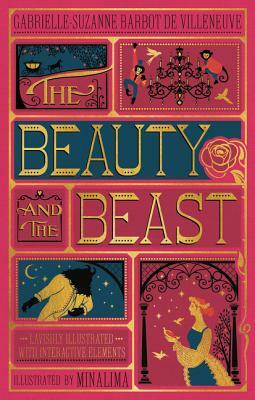 Originally published in 1740 as La Belle et la Bête, De Villenueve’s story of a young woman’s courage, and a love that sees beneath the surface to the beauty in the beast, comes to life with stunning illustrations, a map of Beauty’s French city, a 3D fold-out of the Beast’s castle, a spinning ring, pop-up windows, and lovely ornaments. A must-have for book lovers who cherish beautiful books.